Below is a list of links to new and updated pages between January and the end of March 2018. My favorite hike this quarter was hike #11. It was great to see the restoration of the Millard Canyon Trail up to Tom Sloane Saddle and to see the significant improvement of the Bear Canyon Trail leading down to the Campground.(2-19-2018). Added hikes #1 through #16 on my 2018 Hikes Page. San Gabriel Peak Trailhead to Mt. Deception, Deception Plateau, Mt. Disappointment, and San Gabriel Peak. Millard Canyon to Dawn Mine and Saucer Branch Falls. Mt. Zion Loop via Upper Falls and Upper Winter Creek: added section profile. Added 6 hikes to My 12-Peak Challenge 2018 Page. 52 Hike Challenge 2018 Page. Added hikes #1 through #11 on my 52 Hike Challenge 2018 page. 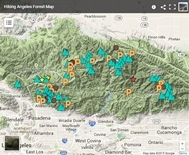 Note: I only included different hikes in Angeles National Forest that go to one of the 12 peaks in my 12-Peak Challenge, so I didn’t do what I set out to do. I did, however, get 52 hikes in this year. Switzer Picnic Area: added a new route. Eaton Saddle: added a new route. Millard Canyon: added three new routes. Colby Canyon: added a new route. Cobb Estate: added a new route. Trail Canyon: added a new route. Inspiration Peak Hiker’s Trail: updated to reflect current trail conditions. Locations have links to more information. #southfalls in #silverfallsstatepark on 3-30-19, 2019 hike no. 6. Seasonal waterfall along the #gabrielenotrail between West Fork Campground and Devore Trail Camp from 3-22-19 in #angelesnationalforest #sangabrielmountains hike # 5. Waterfall near the #arroyoseco crossing of the #gabrielenotrail between Bear Canyon and Oakwilde on 3-14-19 in #angelesnationalforest #sangabrielmountains 2019 hike #4. I hiked up into the clouds on 3-4-2019. It was part of a nice loop going up Millard Canyon. This photo was taken at #dawnstation before I went down to Echo Mountain with a clear view to the ocean in #angelesnationalforest #sangabrielmountains #haf12peaks 2019 hike #3.